I guess you already know that Dropbox can only synchronise the files you put inside it's special folder (~/Dropbox). 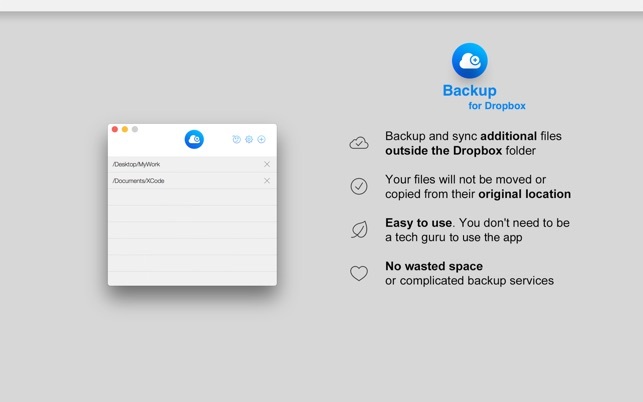 This app solves this limitation and lets you backup any file or folder from your local drive with Dropbox without moving or duplicating your files. Simply tell the app that you want to backup additional folders and that's it! Really. You can forget it's there. Your files will not be duplicated, moved or copied from their original location, nothing will change. will create a shortcut in /Dropbox/Backup linked to documents. Thank you for your review. This application does a lot more than what you suggested to be done in the Terminal - it can list your outside Dropbox folder files, it can create the sync links without knowing exactly where to place them in the Dropbox directory and you can use a friendly interface instead of the geeky Terminal. If you have other questions or you need more details, just send me a mail to hello@alexdenk.eu and I will gladly help you. The insstructions on how to use this are nonexistent. Therefore, I have not been able to figure out how to use it successfully. The app is quite easy to use: just confirm your Dropbox folder and then press the (+) button to add new folders to sync - that's it! You can send me an email to hello@alexdenk.eu and I will gladly help you with more details.